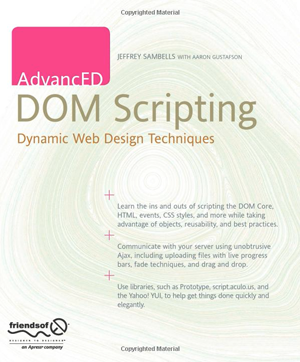 This book takes your Document Object Model scripting skills to the next level. 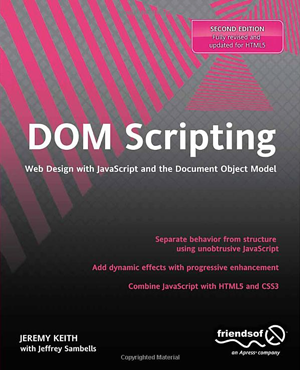 As a web designer or developer, you know how powerful DOM scripting is for enhancing web applications, adding dynamic functionality, and improving the user experience. This book provides all you need for a deeper understanding of the DOM and how to fully take advantage of its hidden gems. Well, after reading AdvancED DOM Scripting I think I finally get it. I guess it’s either because I have accumulated enough DOM scripting knowledge to make things ‘click’, or it’s simply because the book’s main author, Jeffrey Sambells, manages to explain these concepts in a very understandable way. Use web standards to ensure cross-browser compatibility. Harness the power of the DOM to create user-controlled animation. Also includes an introduction to Ajax. This book is for web developers wanting to expand their knowledge of the DOM to add interactivity and functionality to their web pages. …the second edition gets a thumbs-up from me. Until recently, building interactive web-based mapping applications has been a cumbersome affair. This changed when Google released its powerful Maps API. 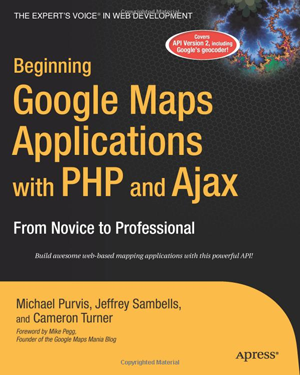 Beginning Google Maps Applications with PHP and Ajax was written to help you take advantage of this technology in your own endeavors whether you’re an enthusiast playing for fun or a professional building for profit. This book covers version 2 of the API, including Google’s new Geocoding service. Authors Jeffrey Sambells, Cameron Turner, and Michael Purvis get rolling with examples that require hardly any code at all, but you’ll quickly become acquainted with many facets of the Maps API. They demonstrate powerful methods for simultaneously plotting large data sets, creating your own map overlays, and harvesting and geocoding sets of addresses. You’ll see how to set up alternative tile sets and where to access imagery to use for them. The authors even show you how to build your own geocoder from scratch, for those high-volume batch jobs. There is much to like about this book. The explanations are straightforward, the code is readable, the examples are relevant, and the writing style is approachable.